Ford is giving consumers the chance to appear in their own movie trailer as a stunt driver. In an experience created by Imagination, participants will learn Hollywood-style stunts from professional stunt drivers, who will teach them moves such as drifting and handbrake parking into spaces. Attendees will take on the role of a racing driver turned getaway driver attempting a casino heist in a film called Go Faster. They will perform the manoeuvres they've learned in a Ford Focus RS hot hatch, as they try to shake the Ford Mustang chasing them. The car chase will be filmed so that people can leave the experience with their own film trailer. Those who sign up to the challenge will be sent a a call-sheet, storyboard and script ahead of the event, which will take place in a custom designed set in Barking, East London between 13 and 22 October. 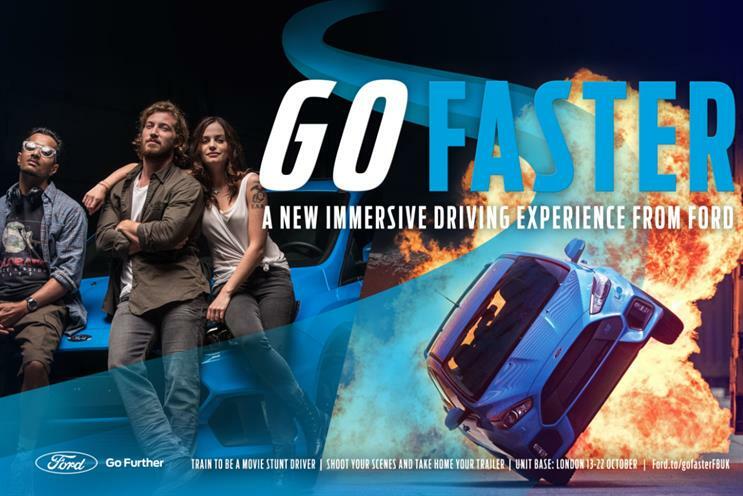 Andrew Merryweather, brand experience manager at Ford, said: "It’s like cinema meets stunt driving lessons, all covered in sleek Hollywood-style production, and it gives participants an unforgettable day out as well as the ultimate brag-worthy content to share with friends."